Today, Broadway almost feels inevitable, but over the past four hundred years there have been thousands who have tried to draw and erase its path. Following their footsteps, we learn why one side of the street was once considered more fashionable than the other; witness the construction of Trinity Church, the Flatiron Building, and the Ansonia Hotel; the burning of P. T. Barnum’s American Museum; and discover that Columbia University was built on the site of an insane asylum. Along the way we meet Alexander Hamilton, Emma Goldman, Edgar Allan Poe, John James Audubon, “Bill the Butcher” Poole, and the assorted real-estate speculators, impresarios, and politicians who helped turn Broadway into New York’s commercial and cultural spine. 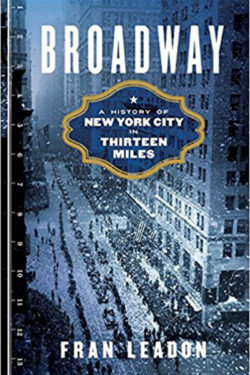 Broadway traces the physical and social transformation of an avenue that has been both the “Path of Progress” and a “street of broken dreams,” home to both parades and riots, startling wealth and appalling destitution. Glamorous, complex, and sometimes troubling, the evolution of an oft-flooded dead end to a canyon of steel and glass is the story of American progress.